4. Sunny days in the fall. According to information from Helen Muntz of the Utah State University Extension office, the record snowpack of 2016-2017, following 10 years of drought, contributed greatly to our rich color season in 2017! As the days get cooler and frost is in the air, deciduous trees and shrubs put on an autumn show in all shades of red, yellow, purple, and brown. Some think that cool weather or frost cause the leaves to change color. 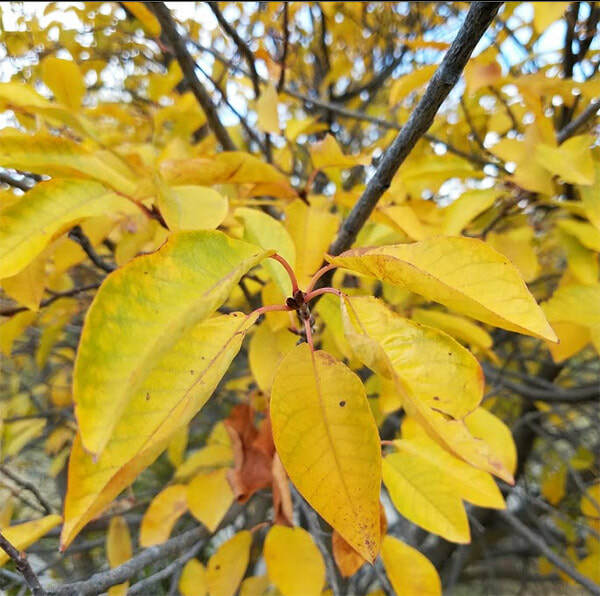 While temperature may dictate the color and its intensity, it is only one of many environmental factors that play a part in painting our trees in glorious fall colors. To understand the whole process, it is important to understand the growth cycle of our trees and shrubs. Most have a relatively short period of annual growth. New stems begin to grow from overwintering buds when the days become long enough and the weather is warm enough to support growth. For most trees, growth is usually completed by late June in the Northern Hemisphere. Next year's leaf buds are set at this time and will not open until they experience the chill and short days of winter followed by the warmth and longer days of spring. Once the leaves are fully expanded and the buds are set, the work of manufacturing and storing carbohydrates to support next year’s growth goes full speed ahead. These carbohydrates are stored in the branches, roots, and buds throughout the growing season to support next year's growth. The process that starts the cascade of events that result in fall color. In late summer or early autumn, the days begin to get shorter, and nights are longer. Like most plants, our trees and shrubs are rather sensitive to length of the dark period each day. When nights are long enough, the cells near the juncture of the leaf and the stem divide rapidly, but they do not expand. This corky layer of cells slowly begins to block transport of materials such as carbohydrates from the leaf to the branch. It also blocks the flow of minerals from the roots into the leaves. Because the starting time of the whole process is dependent on night length, fall colors appear at about the same time each year, whether temperatures are cooler or warmer than normal. During the growing season, chlorophyll is replaced constantly in the leaves. In autumn, when the connection between the leaf and the rest of the plant begins to be blocked off, the production of chlorophyll slows and then stops. In a relatively short time period, the chlorophyll disappears completely. This is when autumn colors are revealed. Chlorophyll normally masks the yellow pigments and the orange pigments — both then become visible when the green chlorophyll is gone. Also, red and purple pigments come from the sugars that are trapped in the leaf. As autumn progresses, the cells in the corky layer become drier. The connections between cells become weakened, and the leaves break off with time. Many trees and shrubs lose their leaves when they are still very colorful. Some plants retain a great deal of their foliage through much of the winter, but the leaves do not retain their color for long. Like chlorophyll, the other pigments eventually break down in light or when they are frozen. Temperature, sunlight, and soil moisture greatly influence the quality of the fall foliage display. Abundant sunlight and low temperatures after the time the corky layer forms cause the chlorophyll to be destroyed more rapidly. Cool temperatures, particularly at night, combined with abundant sunlight, promote the formation of more visible pigments. Freezing conditions destroy the machinery responsible for these pigments, so early frost means an early end to colorful foliage. Drought stress during the growing season can sometimes trigger the early formation of the corky layer, and leaves may drop before they have a chance to develop fall coloration. A growing season with ample moisture that is followed by a rather dry, cool, sunny autumn that is marked by warm days and cool but frostless nights provides the best weather conditions for development of the brightest fall colors. Lack of wind and rain in the autumn prolongs the display; wind or heavy rain may cause the leaves to be lost before they develop their full color potential. For more information see the National Arboretum page, the Science of Color in Autumn Leaves. 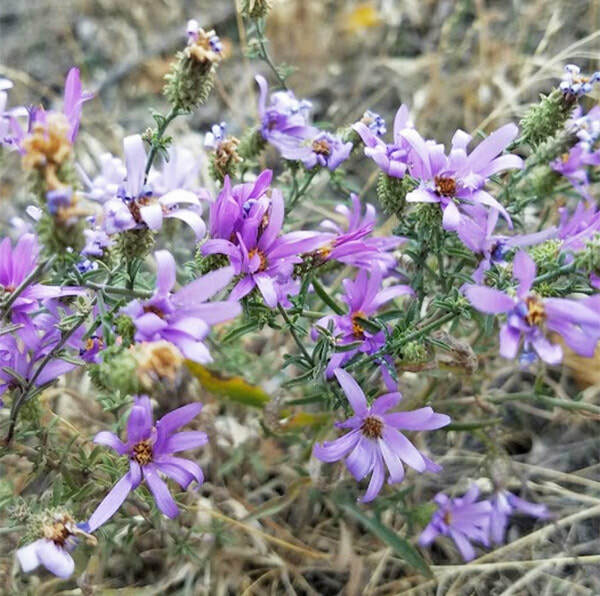 BONUS COLOR: The purple asters are still in bloom!